BALTIMORE -- Baltimore's top police officials, mayor and prosecutor sought to calm a "community on edge" Monday while investigating how a man suffered a fatal spine injury while under arrest. Six officers have been suspended, but investigators say they still don't know how it happened. A week after Freddie Gray was pulled off the street and into a police van, authorities don't have videos or other evidence explaining what happened to cause the "medical emergency" an arresting officer said Gray suffered while being taken to the local police station, Deputy Commissioner Jerry Rodriguez said. The Gray family's lawyer, Billy Murphy, had said Gray's "spine was 80 percent severed at his neck." Autopsy results returned Monday show Gray "did suffer a significant spinal injury that led to his death," Rodriguez said. "What we don't know is how he suffered that injury." Police also released a more detailed timeline of how Gray was arrested and transported April 12. It revealed Gray was placed in leg irons after an officer felt he was becoming "irate," and the van stopped on its way to the police station, even picking up another prisoner in an unrelated case, while Gray repeatedly asked for medical attention. Police Commissioner Anthony Batts said Gray asked first for an inhaler, and then several times during his transport for medical care. "There were several times he made a medical request," Batts said. "He asked for an inhaler, and at one or two of the stops it was noticed that he was having trouble breathing, and we probably should have asked for paramedics." Something must have happened between the time Gray was videotaped by a bystander being dragged into the van, and the time he arrived at the station in deep distress, the deputy commissioner said. "When Mr. Gray was put in that van, he could talk, he was upset. And when he was taken out of that van, he could not talk and he could not breathe," Rodriguez said. Batts also said it is still unclear why Gray was stopped in the first place, saying only that officers "made eye contact" with Gray and another man, and the two took off running. 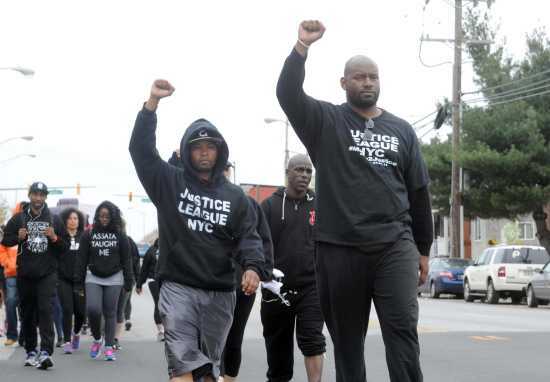 "That's part of the question we have to dig into," Batts said, "if there's more than just running. There is no law against running." Mayor Stephanie Rawlings-Blake said she too is "angry that we are here again" after trying to overcome decades of distrust between police and citizens in Baltimore's inner city. "Our community is experiencing a great deal of trauma," Rawlings-Blake said. "This is a very, very tense time for Baltimore City." Batts said he is ordering police to review and rewrite "effective immediately" its policies on moving prisoners and providing them with medical attention. "We are a community on edge right now. We hear, I hear, the outrage. I hear the concern, and I hear the fear," Batts said, asking for calm. "We are on edge as a city, and I need your help to make sure we get this out in the proper way." All six officers involved have been suspended, said Rodriguez, who is in charge of the department's professional standards and accountability. Officer Garrett Miller's official request for a criminal charge against Gray, a 25-year-old black man who was only 5-foot-8 inches tall and 145 pounds, said that he had been arrested "without force or incident." Miller sought a charge of carrying a switchblade, punishable by a year in prison and a $500 fine, according to court records obtained Monday by The Associated Press. Miller's charging document doesn't provide any explanations for the injuries that would lead to Gray's death a week later. He wrote only that while being taken to the station, on April 12, "the defendant suffered a medical emergency and was immediately transported to Shock Trauma via medic." Another 30 minutes passed before police finally called an ambulance to pick Gray up at the station. He arrived at the hospital in critical condition and died on Sunday after a weeklong coma. The documents, which misspell Gray's name as "Grey," were first reported Monday by The Baltimore Sun. Police had not previously mentioned a knife, or publicly disclosed the charge against Gray. Miller's signed report says he personally recovered the knife from Gray's pocket. It names five other officers to be summoned as witnesses in court, and says Gray was stopped after a brief foot chase because he "fled unprovoked upon noticing police presence." "We have no confidence that the city or the police department is going to fairly and objectively investigate this case," Murphy said. Activists protesting excessive use of force and even Baltimore city officials say they have more questions than answers. About 50 people marched from City Hall to police headquarters Monday, carrying signs reading "Black lives matter" and "Jobs, not police killings." They unfurled a yellow banner reading "Stop police terror." "This is just one of the most egregious cases I've ever seen," said Colleen Davidson of the Baltimore People's Power Assembly, which she said organized the rally at the request of Gray's family. "We felt the need to be out here and make it known that we will not stand and watch things like this happen." Rodriguez said his investigators will hand everything they find over to the office of State's Attorney Marilyn Mosby by May 1. She too appealed Monday for anyone with information to contact her office. "I can assure the public that my office has dedicated all its existing resources to independently investigate this matter to determine whether criminal charges will be brought," Mosby said.